The staff at Monarch’s Facility-Based Crisis Center (FBC) in Lumberton were confident they could more effectively reach the homeless population in Robeson County. While homelessness in any area can be hard to estimate or determine, 2018’s point-in-time (PIT) count, a tally of sheltered and unsheltered homeless persons on a single night in January each year for the U.S. Housing and Urban Development (HUD), counted 68 homeless individuals in Robeson County. This year’s tally completed in late January continues to be recorded with numbers not released to date. According to HUD statistics, the state of North Carolina’s total PIT count for 2018 equaled 9,268 individuals. PIT defines homeless as either living in an emergency shelter, transitional housing or on the street, in cars, abandoned buildings or other places not meant for habitation. The team initially met last fall to brainstorm ways to inform those in their community, who may often be the first line of assistance to the homeless population, about services offered and available through Monarch. Program Director Kellie Thompson, BSN/RN, QP, who began her role at the Lumberton FBC last June, has led the team scheduling visits with local law enforcement officials, community leaders, clergy members and hospital emergency and trauma departments. Lumberton FBC is a 16-bed, facility-based crisis service, in-patient crisis stabilization service offering non-hospital medical detoxification. It serves people with mental health and substance use disorders. The facility operates in Robeson County under the auspices of Eastpointe MCO and also serves the counties of Bladen, Duplin, Edgecombe, Greene, Lenoir, Sampson, Scotland, Wayne and Wilson. Thompson explained that it is common for those that are homeless to have substance abuse disorders and/or mental health issues which can be the source of their struggles and the reason why they are living on the street. “Many times, the homeless population has burned bridges and their families don’t want to have anything to do with them. I like to refer to our service as a midway stopping point for those who have nowhere else to go, to reach out and come to us,” explained Thompson. 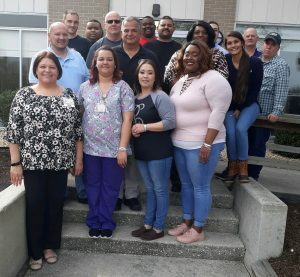 In addition to reaching out to community resource representatives, the Lumberton FBC staff is a member of the Robeson County Substance Abuse Coalition Team made up of health care and mental health care providers, family advocates and local religious leaders, among others. Thompson said this group collaborates with community resources to also better assist the homeless. Reaching out to the homeless can be difficult for a variety of reasons. Thompson pointed out that Robeson is the largest land mass county in the state and does not have a public transportation system. Both details can present issues. The staff’s efforts have proven helpful in spreading the message about their services to referral and resource contacts within the community. She explained that the Lumberton FBC’s services are an important link in the chain of recovery for people supported, serving as a typical five- to seven-day stay drug treatment course of action to bring stability. “During their stay and as part of getting well, we devise a plan and figure out what their next steps should be,” Thompson pointed out. Thompson said working in mental health care for over 10 years, she does not tire of watching individuals choose treatment with the goal of becoming healthy. Thompson said she and her staff often keep in mind a common sentiment that those treated have remarked after finishing treatment. Photo caption: Above left, first responders recently toured the Lumberton FBC to become familiar with the substance use disorder services available. The tour was led by Program Director Kellie Thompson (far left, front) for the group who were students in managed care organization Eastpointe’s crisis intervention training.